Formerly the center of the trans-Eurasian Silk Road, and the home of the glorious Islamic cities Samarkand and Bukhara, Uzbekistan (and the rest of the Silk Road) may once again become central to global exchange, thanks to China’s New Silk Road project – the One Belt Initiative – which promises to end the era of world dominance by a relative handful of pale-skinned sea pirates from the northwest fringes of the vast Eurasian continent. Will NATO try to shore up its eroding influence by accelerating its “destabilization and destruction” program worldwide? Will petrodollar-based institutions like the World Bank, IMF, and the Federal Reserve hang onto their stranglehold over global reserve currency for another decade? Or has the world decisive shifted away from Zio-American hegemony, as more and more countries exit the dollar trading system? 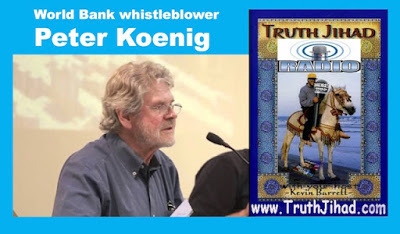 Listen to Peter Koenig and get ready for a whole new world. This show was broadcast on December 13, 2017. This entry was posted on Wednesday, December 13th, 2017 at 2:39 pm	and is filed under Anti-War, Censorship-Propaganda, Econo, Education, Freedom, Geopolitics, Globalism, Kevin Barrett, News, Politics, Protest, Regime Change, War Crimes. You can follow any responses to this entry through the RSS 2.0 feed.